It’s time for round 2 in the Fall Clean Up series! Round 1 was the list of 10 spots in the house to purge every fall. Today digs deeper into organizing five areas as we start to prepare for cooler weather and busier schedules. The decluttering step last week should have cleared out everything that was expired, so now it’s time to organize what is left. I’d recommend thinking about the three things that make you crazy when you are trying to cook or put away clean dishes and focus your time on those. Here’s a few ideas from our kitchen. I don’t bake often throughout the year, but various baking supplies were spread throughout the pantry. 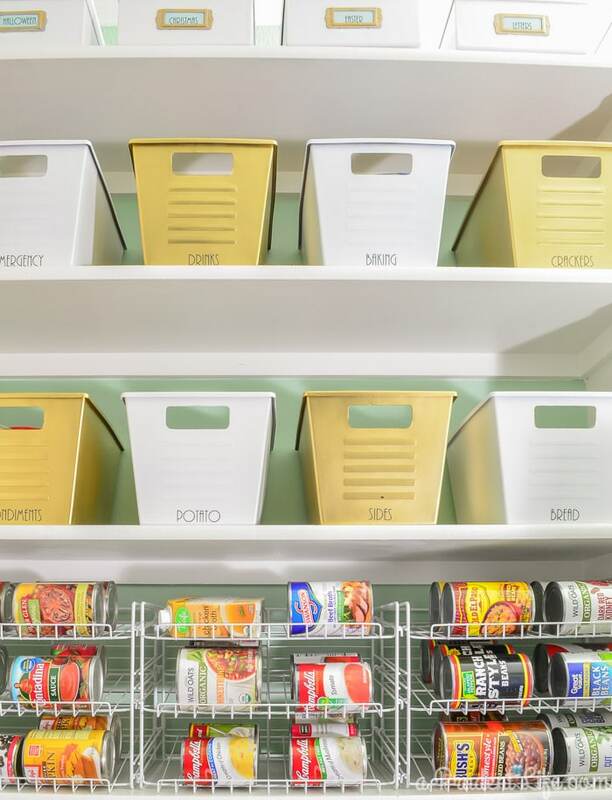 When I organized the pantry, I grouped them all together in a dollar store plastic bin. Before using the bin, I spray painted it gold to match the rest of the pantry accents. Now, whenever I’m in desperate need of a homemade chocolate chip cookie, I can pull the whole bin out to the kitchen. 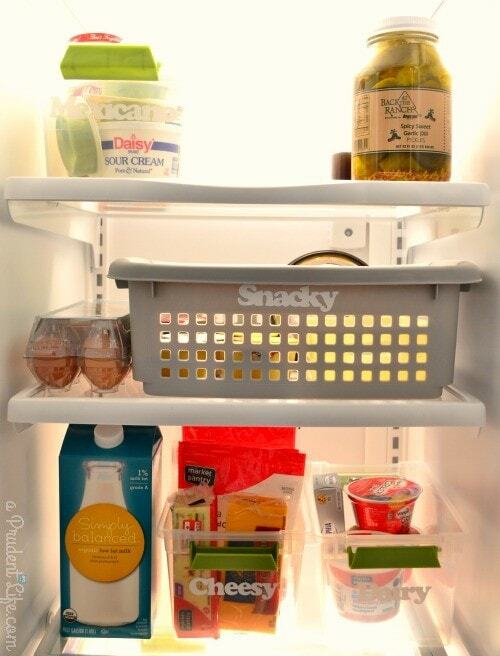 Using bins to corral similar items also works inside the fridge. The hour I spent organizing the fridge like this two years ago was so worth it. It finally started to get out of control again this summer, so I’ll be getting it back into shape this week as part of my personal fall clean up! 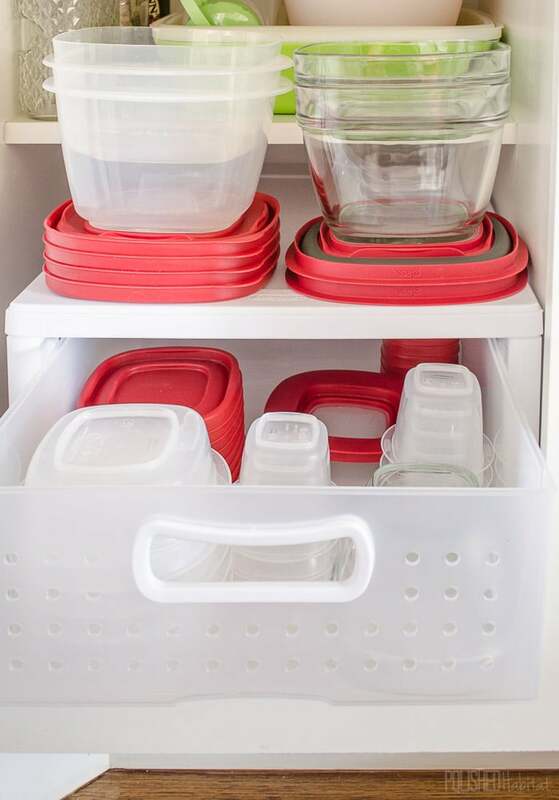 The plastic ware is another great cabinet to tackle before the season of holiday leftovers begins. I don’t know what took me so long to figure out how to store them, but I get a little excited every time I open the cabinet and see them under control. Since I was in organizing mode, I did some reorganizing of the blog and grouped all my kitchen organizing posts together, so you can browse through them for more ideas here. If you’ve got kids in school, now is the time to figure out a landing zone for backpacks, shoes, coats etc. 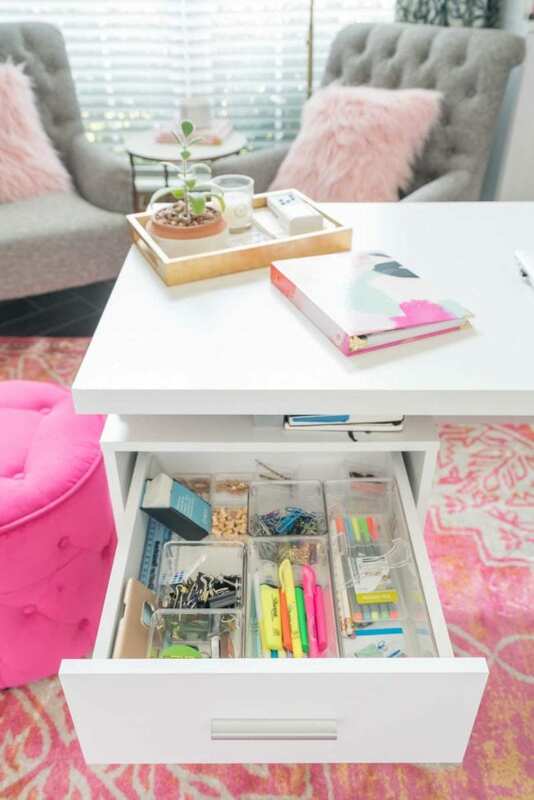 Having a routine place to drop things starting at the beginning of the year will save so much time searching for things and help control clutter. You can fake a mudroom really inexpensively using a cube organizer on it’s side by the front door, with a bin for each family member. 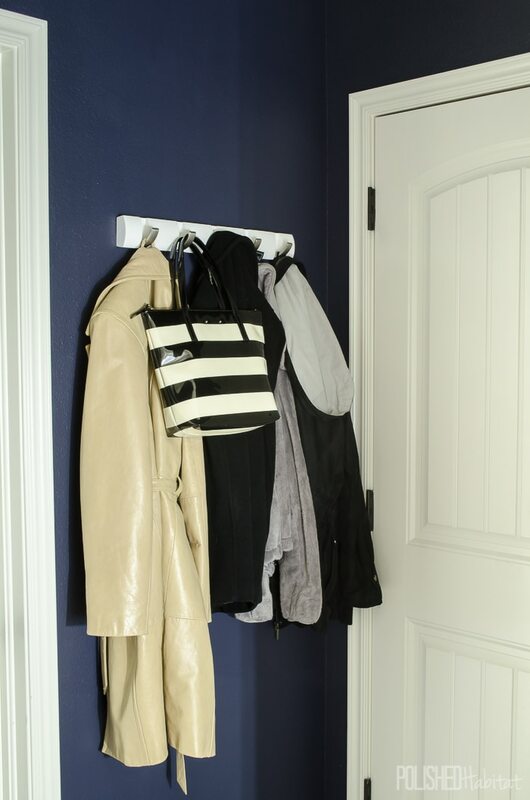 Above the bins, add coat hooks for backpacks and you’re all set! If you’ve got REALLY limited space like we do in our garage entry, I’ve been really happy with the slim hooks we installed for coats and my purse last year. The hooks flip flush when not in use, and hold a surprising amount of weight when we load them down in the middle of winter. It was a great way to utilize a previously wasted wall behind the door. 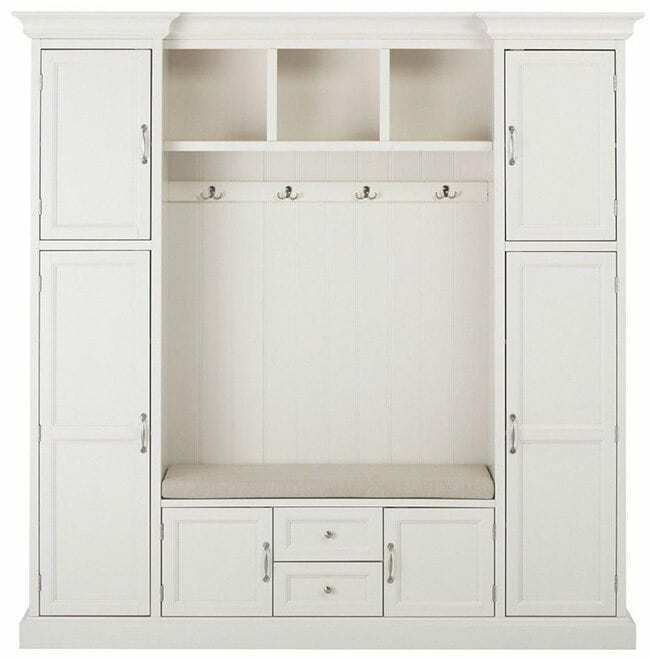 If you have a bit more space and budget flexibility, you can pick up one of the freestanding mudrooms I featured in the storage furniture post. I mentioned that fall is a great time to declutter kid’s rooms of toys and outgrown clothes last week, but then what do you do with everything that is left? Bins and baskets are a huge help! 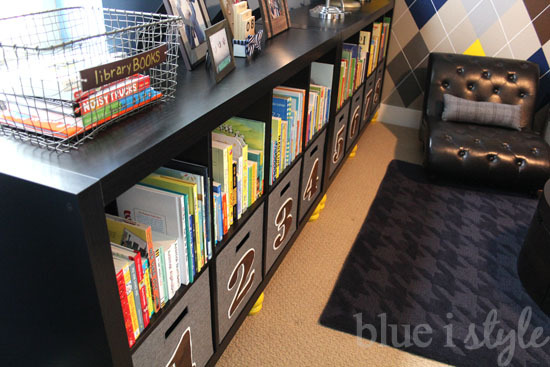 I love the DIY Numbered Bins that Angela from Blue i Style created for her son’s room. Don’t miss the basket for library books on top of the shelving. So smart! You can see tons more ideas for organizing with kids in this 10 Tips To Clean Up Toys Faster post and you can see the rest of that amazing little boy’s room here. If getting dressed in the morning is a struggle with your kids, try this easy day of the week system. Is anyone else guilty of letting the guest bed turn into a landing pad for the most random crap? I kid you not, there was still CHRISTMAS junk on ours until JUNE this year. Thank goodness we had some family come to stay with us so I finally had to clean it up. 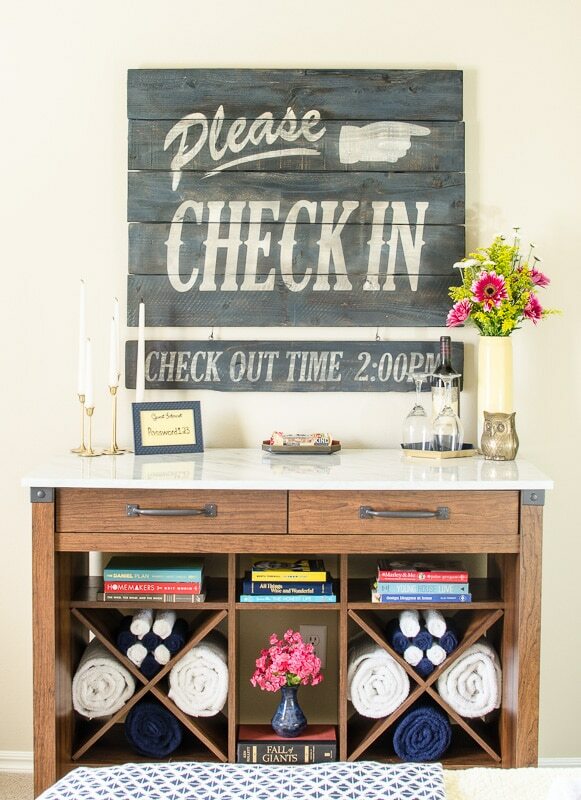 Don’t wait until right before Thanksgiving or Christmas to organize your guest space. No one needs more things to do around the holidays. 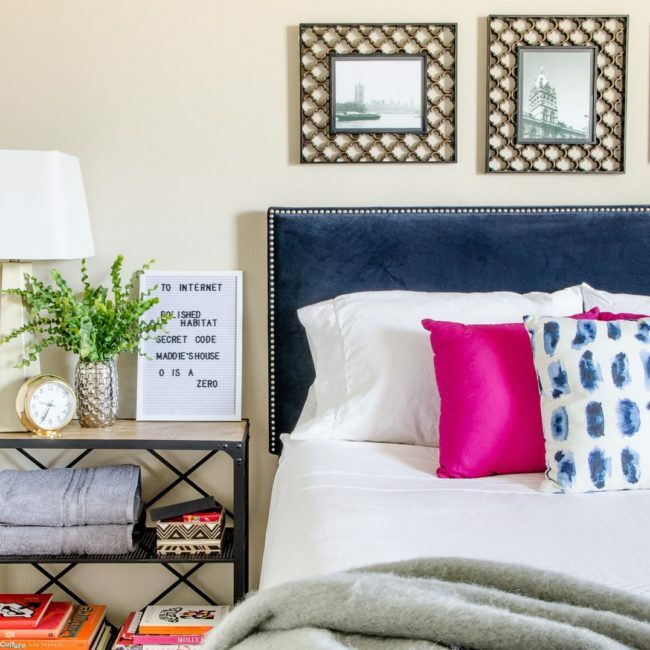 I shared all my organized guest room essentials last year, but my best tip is to spend a night in the room. We slept in ours during our master bedroom makeover and immediately ordered this plush mattress pad from Amazon. It was like we bought a new fancy mattress! I also realized that it was really difficult to get to the outlets if you wanted to charge your phone on the nightstand, so I bought power strips to run to each side of the bed. 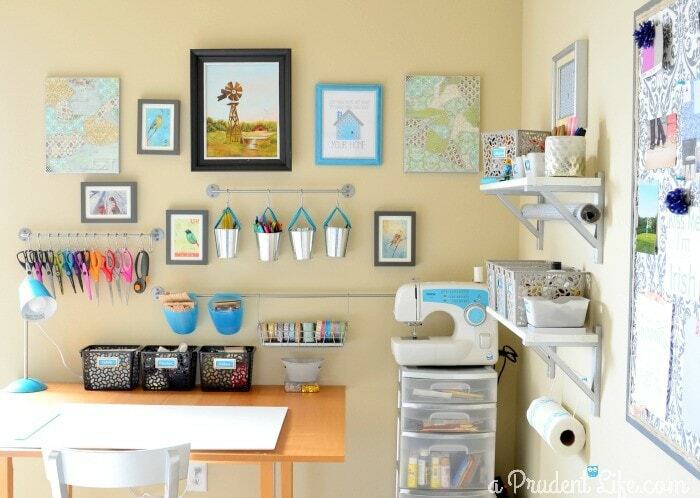 The last space I think fall is the perfect time to organize is wherever you keep craft and/or office supplies. I love using IKEA rail systems to store things on the wall. Even though I’m not currently in school (thank goodness! ), I get a bit excited about school supplies and office organization every fall. If you’ve been following along, you know I got a jump start on this one and have all my paper clutter and office organization under control. Hooray! There’s a reason I think we need to work on the organization in these areas EVERY fall. Our lives and habits evolve, which I believe is why some people think organization doesn’t work. They do it once and expect it to last forever. Tweaking the systems once a year lets you evaluate what’s working and what needs to be updated. Having a designated season to work on the key areas of your house will help you stay on top of everything year-round. And that makes the time spent SO worth it for me! What do you think? 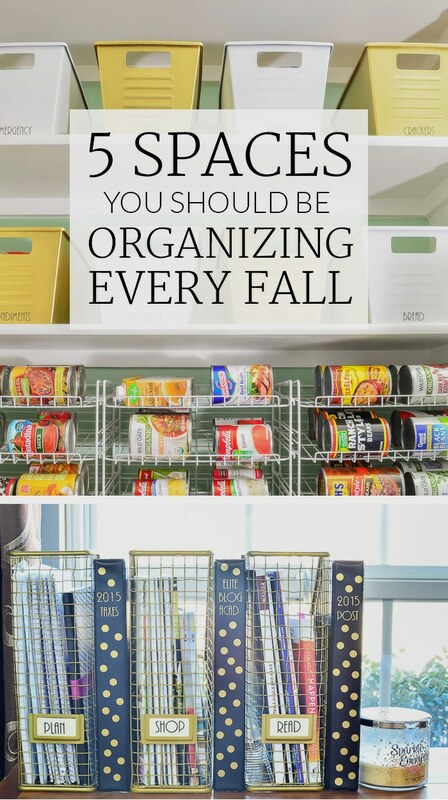 Did I hit or miss the most important areas for fall organizing? Don’t forget to go back to week #1 of the Fall Clean Up if you missed it! Another great post, as usual! Oh that magazine filing system is brilliant! Going to definitely be using some of these tips! Hi Melissa!!! Just getting caught up on your posts after a very busy summer…and you knocked it out of the park again, as usual!! Such great ideas, I am passing this post along to my daughter with 3 girls, 2 school-age now. Life just seems a bit easier when we are organized! A little time upfront makes every day after go so much more smoothly! Thanks for sharing your great ideas with us!!! So good to hear from you, Sarah! You’ve been on my mind this week. Can’t wait to catch up!